One of the many great local products we stock in the 21 Acres Market is hazelnuts from Holmquist Hazelnut Orchards. The Holmquist family produces locally grown hazelnuts, hazelnut oil, hazelnut flour and hazelnut butter in Lynden, Washington. Comparitively, Washington State is a small producer of hazelnuts, with Oregon producing the lion’s share of American hazelnuts. 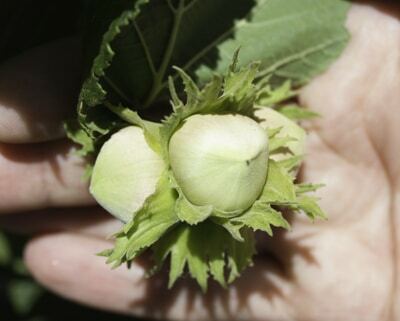 Interestingly, most of the worlds hazelnuts are actually grown in Turkey – halfway around the globe. I traveled to visit Holmquist Hazelnuts recently to take a tour of the hazelnut orchards which is adjacent to the Canadian border in Whatcom County. Brian Holmquist looks after the orchard along with his father Gerald, while his brother looks after the accounts. The Holmquists have been running the farm for over 85 years. They grow the DuChilly variety of hazelnuts, which is a magnificently sweet hazelnut with a very thin skin. 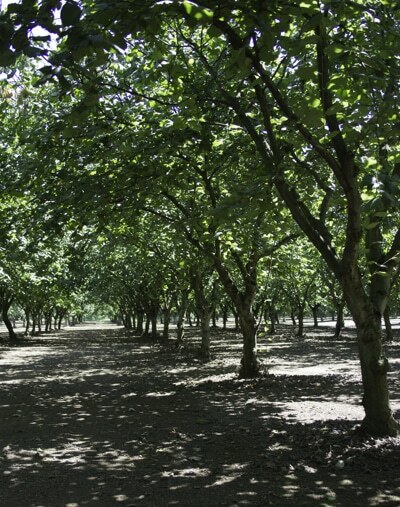 The hazelnut orchards are beautifully mature, and the farm is picture perfect. The Holmquists have two dogs, Lola and Champagne who work hard at keeping the squirrel population at bay. When I visited, the hazelnuts had just turned a pale shade of brown and Brian says that harvesting will begin in October. The farm is steeped in history with evidence of old machinery mixed with the modern equipment to harvest the nuts. Machinery has changed over time, and their new tractor can now harvest the nuts much faster than the old one. The art of growing hazelnuts and tending the farm, however, remain much the same. There is a sense of timelessness about the Holmquist farm. Despite all the changes that have happened with modern technology, the beautiful mature orchard is proof of a long and enduring family history. Brian recalls the history of the farm as we walk around, and what it was like to grow up on a hazelnut farm. He jokes that there are not many pictures of him as a young boy, but there are plenty of pictures of the hazelnut trees. The Holmquists are passionate about their hazelnuts, and they are constantly thinking of new flavors and recipes for their hazelnuts. Their hazelnut flour is a fantastic gluten-free alternative for baking, and is especially delicious in a chocolate cake. Their hazelnut oil adds a huge depth of flavor to salads, and tastes delicious on cooked meats. So, when you are thinking of buying local, don’t just think of fruit and vegetables, consider buying some delicious local nuts. By the way, if you’re inspired to read more about the Holmquists and find a recipe using hazelnuts, please visit my blog. My very favorite hazelnut recipe is this one for Brown Butter Hazelnut Cake with Praline.